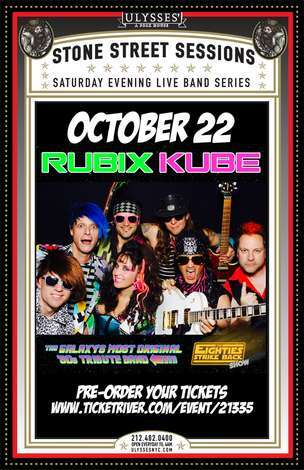 RUBIX KUBE is taking the universe by storm as the most original ‘80s tribute band of all time. Its one-of-a-kind “THE EIGHTIES STRIKE BACK Show” is performed in their NYC headquarters, across the planet, and to galaxies far . . far away. It’s more than just a cover band - it's a totally awesome, true '80s Experience! The KUBE is led by a male and female dynamic duo of karma chameleons, able to transform in the-blink-of-an-eye into the voice and character of any '80s icon. It's like Madonna, Michael Jackson, Cher, Prince, Devo, Bon Jovi, Guns N’ Roses, and more are teleported right before your eyes on the same stage, in one concert! Their supporting sidekicks are all decked out in vibrant, vintage '80s threads and with enough hairspray to take down Freddy Krueger, The Terminator, Beetlejuice, and all The Gremlins at once. The band is able to crank out Pop, Rock, New Wave, Dance and Hair Metal hits from the decade of decadence and perform them just like the originals - yet with their own gnarly twist. Prepare for the most bodacious, totally rad and ultimate time-warp at “THE EIGHTIES STRIKE BACK Show" starring RUBIX KUBE!